This so called “Na Nach Kippah” has become very popular amongst many Breslover Chasidim over the past years. The style has spread to youths on Israel’s outposts and hilltop settlements as well. 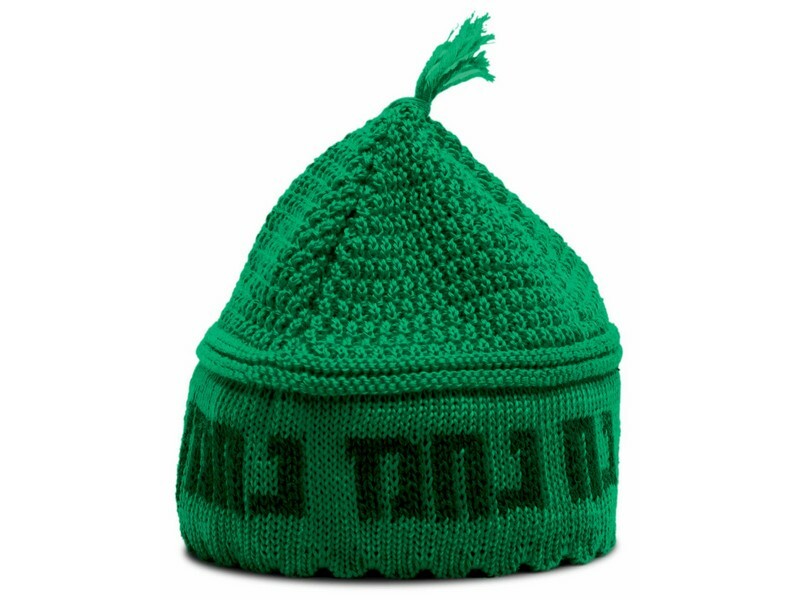 This comfortable knit kippah fits snugly over the head. The kippah has a wide bottom band with a domed style finish, with a tassel on the top. The Hebrew words “Na Nach Nachma Nachman Me’Uman” is knitted in along the bottom band. These words and chanted by many of the Breslover Chassidim, and believed to be a segulah charm and helpful when in a difficult situation. The kippah is available in green with dark green lettering and olive green with white lettering. The Kippah is available in medium and large sizes. Rabbi Nachman of Breslov (1772 – 1810) was the founder and leader of the Breslover dynasty and Chassidic sect. He was buried in the city of Uman, Ukraine where he spent the final years of his life. Tens of thousands of Jews from around the globe make an annual pilgrimage to his gravesite for Rosh Hashanah, the Jewish New Year. His gravesite is frequently visited by many throughout the year as well.